With the increased focus of health and safety in the workplace and the rise in compensation claims for industrial deafness it is becoming more important to protect employees from exposure to noise. The Control of Noise at Work Regulations give guidelines as to how employers can go about protecting their employees and in turn protect themselves from compensation claims. The Control of Noise at Work Regulations were updated in 2005 with more stringent requirements. We can undertake workplace surveys in accordance with the current regulations for companies of any size and type. The survey report will identify the exposure action values at all work stations and the statutory requirements for further action by the employer. We can provide acoustic design advice for any work areas that require a reduction in noise levels. Noise at work assessments should be conducted in noisy workplaces including manufacturing premises, engineering works, factories and warehouses to name a few, to establish which areas of a workplace should be mandatory hearing protection zones. During a noise at work survey we use a hand held sound level meter to take frequency specific measurements at areas throughout a workplace. 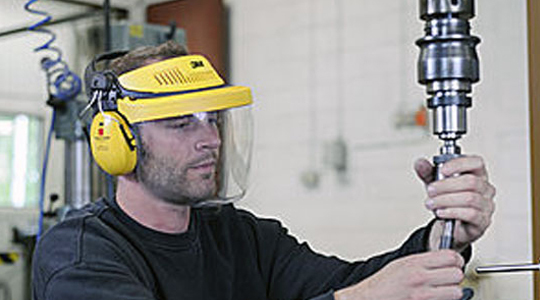 These results are used for the specification of hearing protection, or to ensure that hearing protection currently in use is sufficient to protect employees from the sound they are exposed to. We use the latest DoseBadge equipment for these tests which is unobtrusive and allows your employees to continue work unhindered by the survey. These hearing tests take around 15 minutes per person and are an effective method of identifying any employees who may be suffering with loss of hearing that could be associated with exposure to noise at work. Audiometry tests are conducted on site either in a quiet room such as an empty office or meeting room.